Megadeth closed the second leg of their Dystopia 2016 tour on the east coast at the BB&T Pavilion in Camden, New Jersey. While Megadeth have already toured earlier this year, they have circled back to give fans an additional opportunity to be part of a great evening of metal that only they can deliver. The band’s current album, Dystopia, is superior, demonstrating both brilliant lyrics and monumental melodies—a staple feat shown throughout the decades. It’s hard to keep track of the musicians who have come and gone with this band. 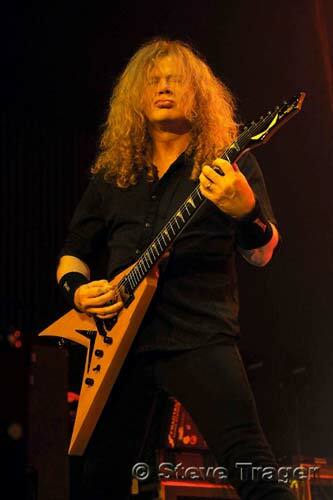 However, Megadeth seem to have found new energy with guitarist Kiko Loureiro from Brazilian thrash metal titans, Angra. The actual turnout of the last show of this tour constituted of a mere 3000 fans. Despite the fact that Megadeth tours often and plays the same handful of songs, it was quite nice to watch the support artists who seem to tour less. The support band for this tour included Butcher Babies, Metal Church, Suicidal Tendencies and Amon Amarth. Sitting through opening bands can only ever be positive; they are a great form of entertainment. Having never watched Butcher Babies before, I thought they were good considering they had about as much room as a small square room to move around on. While the performance could’ve sounded better, their 25 minute set was great. As the show went on, it felt like music in the late 80s to mid 90s with the following bands Metal Church and Suicidal Tendencies. Both of these bands were at the top of their game back when thrash metal was on the rise and making its way into the ears of many young metal-heads. The show was very timely up to this point with sets built and taken down from the stage quickly, as if with a blink of an eye. Eventually, direct support band and Viking metal titans, Amon Amarth who hail from Stockholm, Sweden, graced the stage. Watching 40 minutes of brutal European metal definitely makes you want to wreck your neck a few times. While I am fond of many different European bands, these guys proved to their fans that they came to rage. They delivered a power-packed set compiled of multiple records, spanning their musical career as a band well-known across the world. After four bands and about three plus hours, the stage was set for Megadeth’s final night of the Dystopia tour. Their set-list was no surprise with a lineup of familiar songs heard in past shows. They do, however, entertain fans well while their new guitarist, Kiko, fits right in like a glove. I don’t think I’ve seen a tighter band than this line up in years, even after seeing Megadeth countless times with different lineups. Megadeth’s set was really simple yet effective; all of the well-known favorites we all have come to expect as well as a few new songs from their new album, Dystopia. While for the most part the show was great, it would’ve benefited from five or six new songs to avoid any boredom. Kiko’s guitar work was seamlessly amazing, especially on solos in the songs In My Darkest Hour, Hangar 18 and Sweating Bullets. If the music wasn’t enough, visually, the show was another spectacle of a production complete with lights and superb sound. We can all hope that Megadeth’s current lineup holds out for a few more years and we all get a chance to watch them at their best. The show was well worth every penny to watch on their last night, rounding out a great tour package.